Match-3 game might not be something revolutionary, but you will like Farm Heroes Super Saga APK 0.37.6. Developer for this game is renowned for specialty at matching game. Several of products gain huge success on game industry. With simple basic concept, the game turns to be more attractive and enjoyable. Farm Heroes Super Saga focuses on farmer to gain more crops. Rancid racoon is the main villain in this game. He cheats and tries to steal crop. Player can use many things at disposal to prevent Rancid steal things. As usual, this game has attractive background and superb graphic to look more appealing for player. Playing Farm Heroes Super Saga is simple. You should make three crops at the same color horizontally or vertically. Player receives points after succeed to match three same crops. Besides three, you can try to create four crops at the same time. At first glance, it looks simple and easy. However, wind will blow to change crops position. Red and yellow at right might be turn purple or blue because the wind. It is very tricky, so stay alert for where next wind will come and calculate direction. To give more excitement, developer puts 100 levels on this game. You can start from the lowest and pass all of them until reach the top place. It takes time to reach top level because the obstacles get harder. This game is recommended to spend time during waiting period at airport or station. You can let children to play this game because it is very safe. This game does not have improper content or language. Player can use social media to connect with friends and others. Leaderboard will show top earning point on this game. Player is able to see who the best player is and try to beat his or her record. This game has been downloaded millions time. Farm Heroes Super Saga for android is another interesting and challenging match-3 game with refreshing features. 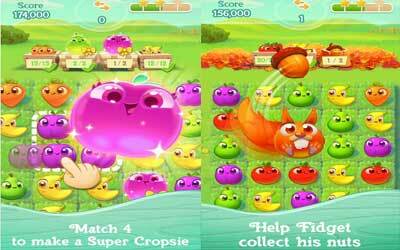 Farmtastic game modes and super sized new Cropsies! A host of new Heroes, but watch out for Rancid Racoon, causing mischief where you least expect! Exciting new Country Show, see who can grow the biggest Cropsie! Embrace your inner Tarzan in our NEW EPISODE, Jungle Sunset! In these 15 NEW LEVELS, you’re going to need a more than a wild side to complete them! TOP TIP! When in doubt, make a square match! It’s likely to be useful later.